On the west side of Orange Avenue, at the corner of Church, is the White House Candy Palace at 140 South Orange Avenue. The Candy Palace was built circa 1908 and demolished circa 1928. The building replaced an earlier one that was destroyed by fire in 1907. The original building was white, which is how the White House Candy Palace got its name. The Candy Palace was replaced by the First National Bank Building in 2011. On the east side of the street is the Guernsey Hardware building, formerly located at 135-141 South Orange Avenue. The hardware store was constructed circa 1881 and demolished in 1924. Guernsey Hardware as originally the Cassius A. Boone Hardware Store. Boone operated his hardware store along with his partner William A. Patrick. In 1895, the building and the stock was purchased by Joseph L. Guernsey. Boone chose to go into the citrus industry instead of running a store. Guernsey Hardware operated in the store until 1922 when the Woolworth Company obtained a 99-year lease and in 1924 built a new building that stood until 2004 when it was replaced with part of The Plaza office complex. BIRD'S EYE VIEW OF ORANGE AVENUE, LOOKING NORTH, ORLANDO, FLA.
Dear Leutiv[? ]-received your card we are both well- will write you a letter soon-we have been so busy here cleaning, and other things too. The weather has been bad here. 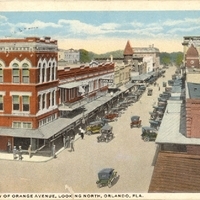 “Bird's Eye View of Orange Avenue Postcard.” RICHES of Central Florida accessed April 18, 2019, https://richesmi.cah.ucf.edu/omeka/items/show/973.